Love to go to Central Italy, full of history, wine and oil? The Umbria region is for you then: in the center of Italy, the many Etruscan sites and medieval hill towns will embrace you and your family in a relaxing and lovely journey. 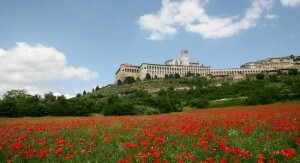 Umbria is Italy’s “green heart” (cuore verde) full of nature parks and reserve. Umbria also offers one of Italy’s largest lakes, Lago Trasimeno, waterfalls and it is less expensive than Tuscany! let’s start our tour from the beautiful hill town of Orvieto build on tufa stones high peak with a contryside full with Etruscan tombs and vineyards. The origin? You can trace it back to Etruscan times, milleniums ago! The stunning cathedral shows a mosaic facade and it is a incredible building and one of the most important medieval monuments in Italy. Close to Rome, from Orvieto you can visit southern Umbria and the close-by Tuscany. Furthermore, from Orvieto you can reach easily Assisi, the pilgrimage home town of San Francesco, the patron saint of Italy. The Basilica in Assisi has the tomb of Saint Francis together with a lot of other interesting churches, ruins, medieval sites, museums within its walled medieval center. Spoleto is the largest towns in southern Umbria with Etruscan, Roman, and medieval sites. The medieval Rocca is above the town: a deep gorge is on one side of the Rocca, the other shows the Ponte delle Torri for a breathtaking sightseeeing. A fab Festival dei due mondi is held in Spoleto too, in late June – early July. Perugia is Umbria’s capital and the largest town. Again an hill town with Etruscan and medieval roots famous for its University, a good Italian language school, an international jazz festival, and a jummy chocolate festival (Eurochocolate in Spring). Don’t miss out here the Chocohotel: if you love chocolate you will find a restaurant with chocolate menu!!! This entry was posted on Friday, June 29th, 2012 at 11:42 am	and is filed under Discover Italy. You can follow any responses to this entry through the RSS 2.0 feed. You can leave a response, or trackback from your own site.